Hi everyone! When planning for my excellent adventures in Iran, I reached out to Margot to reprint some of her recipes. She generously insisted however on writing a Persian inspired recipe specifically for Fig & Quince. I feel lucky and privileged to have made such a caring and wonderful friend. Margot’s shiny personality gleams and glints and sparkles in all of her posts on her beautiful blog. Gather and Graze may be less than a year old, but it is already a treasure trove of reliably good recipes that are carefully and beautifully presented. Margot prepares food with love and it shows. Take this recipe for example, a dreamy concoction made with Australian apples, pistachios, rosewater and cardamom. Sigh! Go and visit Gather and Graze. It’ll make you hungry but it will also feed your eyes and soul. Then come back and read about this beautiful recipe. My friend Azita is traveling overseas over the next couple of months… to her beloved homeland of Iran that she hasn’t seen in 35 years. Her excitement and anticipation for this journey is well and truly infectious! Not long ago, she approached a number of her blogging friends to help out with providing a ‘guest post’, so that Fig and Quince may continue to run smoothly during her time away. I was completely humbled (and surprised… and excited…) to be invited me to do this… Gather and Graze is still less than a year old and most of the time I still feel like the new kid on the block… winging it as best I can. (Editor’s note: doing a wonderful job! Wishing you huge success!) The one request she had, was that my dish, if at all possible, should have a Persian-slant to it. 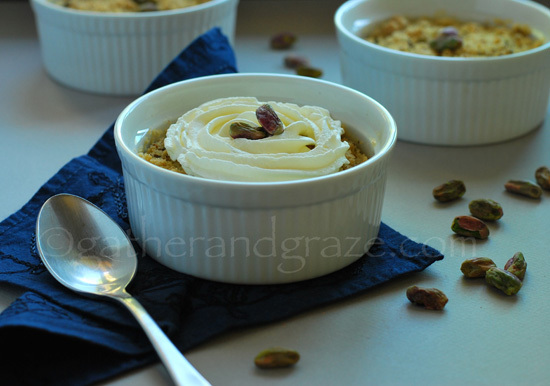 pistachios, barberries & ground cardamom | sigh! Beautiful (new season) Australian apples have been infused and enhanced with the exotic delights of cardamom, pistachio, barberries and rosewater to create a Persianised Crumble that (may not rival the foodie delights of Tehran and surrounds, but…) will at least touch upon some of the flavours that make Persian cuisine so delicious and unique. 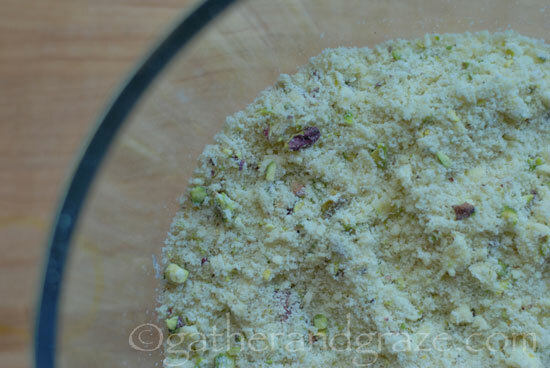 Start by making the crumble topping… Place the pistachios, flour, raw sugar and salt into a large mixing bowl and stir to combine. Add the 75g portion of butter (that has been diced into small cubes) and rub into the flour mixture using fingertips. For the apples… place a medium saucepan over medium heat and add the 15g portion of butter. Once it has melted, add the apples, barberries, brown sugar and cardamom and allow to cook for 4 to 5 minutes (just enough time for the apples to soften slightly and for the barberries to rehydrate a little). Divide the apple mixture evenly into either individual baking dishes/ramekins or one larger-sized baking dish). Spread the crumble mixture evenly over the top of the apple. Place the dish(es) into the oven and bake for approximately 25 to 30 minutes until golden on top.Allow to cool a little, before serving warm with rosewater cream (simply whip together the cream, rosewater essence and icing sugar until you have medium/stiff peaks) and/or ice-cream. Another delicious alternative is to mix together some vanilla ice cream with rosewater essence (about 1 teaspoon rosewater to 200g of ice cream). If the ice cream softens too much during the mixing, place it back into the freezer for half an hour or so, to harden a little. This was absolutely perfect with the apple crumble – I can well and truly recommend it! 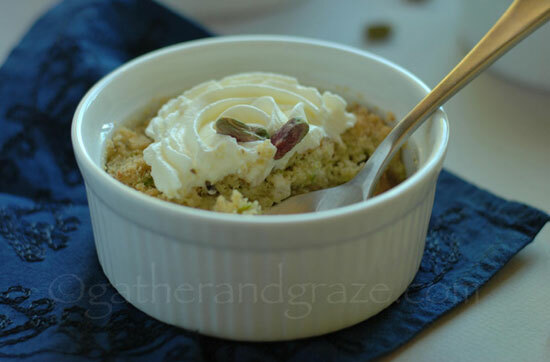 Thank you Margot joon for graciously allowing me to post one of your beautiful recipes! And you guys, don’t forget to keep in touch with me while I’m away via Facebook and Twitter. or Instagram. Miss you and I’m waiving hello – as I picnic near a stream under a weeping willow tree – all the way from Iran! I love Margot, her blog and especially her recipes. Her crumble sounds delicious. Love the addition cardamom to the apples and the rosewater to the cream. Such a nice post! This may be one of the most beautiful desserts I’ve seen. 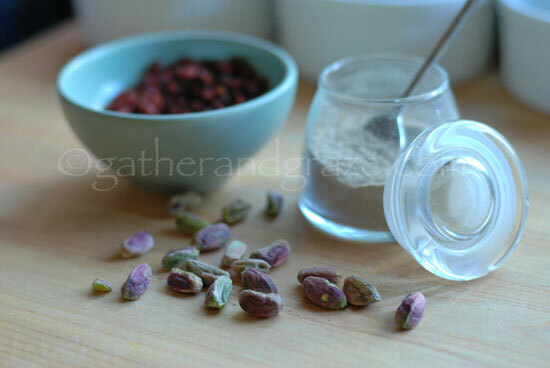 I love cardamom, barberries and certainly rosewater, Azita. There’s something so elegant about this dessert. From the ingredients all the way to the presentation, you’ve made it look sophisticated but also totally delicious. Oh my goodness, how divine! What a wondeful dessert! Love the presentation! Simple yet chic!